While sharing his sense of nostalgia and spontaneity, I was worried. Tortilla Flats doesn’t have the best reputation for its food, and the things we like when we’re twenty often don’t translate well when we’ve advanced to middle-age. But Tortilla Flats has a small spot in the nostalgic “remember when we were 20″ place in my heart, so in we went, hoping to be wrong. The work done a few years back when Still Lounge owners converted the crusty old Connaught Tavern was pretty much for nought. The sandblasted brick outside is now a harsh yellow and the inside is garish, cluttered, and after only a few years, looking rather run down. We’re directed to a booth, but the seats are so high my feet, even in chunky shoes that put me at around 5-foot-8, don’t touch the floor. A relocation further back in the room offers us a view of a collection of dirty glassware piled on the bar, and garbage bins, one marked with a warning of what can go in there and the cost per bag for city pick-up. Classy. Our server, bless his eager little heart, does try, but misses the mark more often than not. When I ask if the margaritas ($6.20) are fresh or from a mix he looks confused. “What do you mean?” “Uh… juice or powder?” “Oh, powder!” he exclaims, almost proudly, and heads to the giant slushy machine behind the bar to pour me an example of the frozen version. 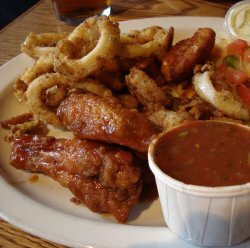 We order an assortment of items and in record time the Flats sampler ($14.25) arrives at the table, laden down with many types of greasy grub. The chicken wings are passable if bland, the calamari rubbery and obviously pre-frozen and the nachos are coated in so much greasy pre-shredded cheese from a bag that they go soggy before we can eat most of them. Something called Texas Twizzlers appears on the menu but we have no idea what that’s supposed to be and can’t find it on the platter anyway. Garlic cheese bread (you know, from the Italian part of Texas) is bland and unmemorable. An array of battered and deep-fried hot peppers round out the assortment, and are the only real interesting things on the plate. It’s all I can do not to reply to the server’s query of “how’s that platter treating ya?” with a suggestion to call me in the morning when I have a better idea. The mains arrive well before we’re done the appetizer, and things actually go further downhill. 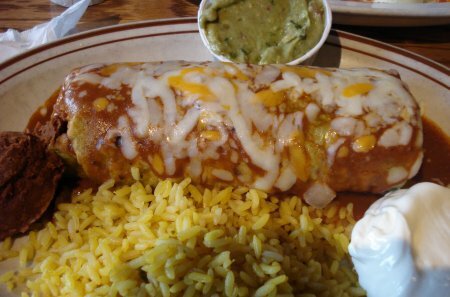 The veggie burrito ($9.99) is topped with more of that assorted grated cheese and comes with some bland yellow rice and an ice cream scoop of refried beans. The burrito’s filling appears to be mostly iceberg lettuce with some sauce and beans, which to their credit are a better flavour and consistency than the quickly hardening lump of refried elsewhere on the plate. I thought I was being smart by ordering a side of guacamole ($2.25), because a dollop of citrusy, garlicy avocado can save just about any pseudo-Mex dish, but this version was low on lime and garlic and appeared at the table an odd greyish colour that looked as if it had been made from avocados that had been cut and left to oxidize. Flavourless and ugly. 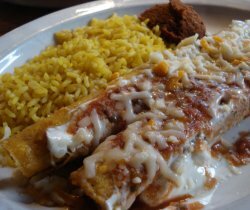 Across the table the chicken flautas ($9.99) are covered with sauce and cheese and are paired with the same scary yellow rice and crusty refried beans. The filling in these rolled, deep fried tortillas is supposed to be creamy chicken, but the sauce part has an odd doughy consistency reminiscent of soggy bread. We both leave more than half the food on our plates. But wait, there’s more. While never hitting that junk food sweet spot of “so bad it’s good” we’ve moved into some version of “so bad it’s hilarious” and feel we have to see it through to the end. Coffee and dessert it is. 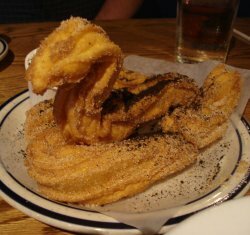 We’re worried when the husband looks up at the pass and exclaims “what the hell is that thing?” in reference to something that appears to be a pastry version of a snake about to strike, and become even more so when it heads for our table. Close up, the freehand churros ($3.95) look more like a duck than a snake, but as they’re made to order, the long donut sticks sprinkled with cinnamon sugar are actually the best thing we’ve eaten all night, despite the garnish of edible oil product and crushed oreo cookies (note for the confused – not authentic!). 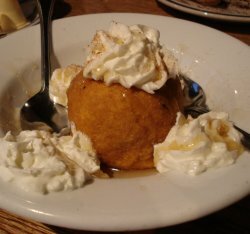 We eat and enjoy most of the duck-snake, but the deep fried ice cream ($3.50) is less pleasing, having obviously been fried in advance and returned to the freezer – the cornflake-based coating is hard, but bland, and the ice cream inside is rock-solid. This dish would have been so much better with a freshly fried, slightly greasy coating and soft melty ice cream as a reward for breaking through the outer layer. I also remember this dish being made back in the day with cinnamon ice cream, but now it’s a not especially great quality vanilla. Too bad. Despite the mediocre food, the place sees a steady string of patrons during our visit, most heading for the patio for reasonably cheap beer and margaritas. It’s a young clientele, with few customers appearing to be past their mid-twenties. I remember being impressed with Tortilla Flats back in the day; it was the perfect way to start an evening that included dancing to the wee hours at the Silver Crown and the Twilight Zone. Now a more worldly palate and an aging digestive system offer only protests at the thought of so much grease and tequila. It’s likely a fine place to dine if half-price powdered margaritas seem sophisticated, but is probably best avoided by those looking for anything verging on authentic or, you know… good.